We are asking for financial support to make the “UNCOLONIZED” film tour a reality. We will be touring the USA starting this spring and would like to tour the film with the entire family in the film as much as possible. That means touring with a total of 6 people, which definitely makes costs prohibitive. We have no funds upfront, and though we will be getting some support from universities we are expecting to have to cover our travel expenses up front. Please do give what you can, any little bit helps out! 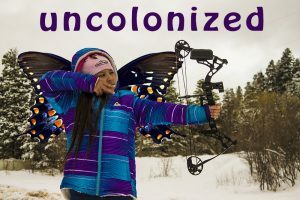 Uncolonized is a short documentary film about a native family who decided never to enroll their two daughters into the public school system, choosing instead to homeschool them from birth. Chris is Potawatomi and Chasity is Navajo. Their daughters Nathaney and Mimicah, ages 11 and 7 at the time of filming, carry both of their parents’ lineages in the their blood, but also in their way of being. The film takes a critical look at the historical experiences of native children inside of the US public education system, and brings clarity to the decision of this family to keep their daughters out of the public school system, and therefore keep them UNCOLONIZED.